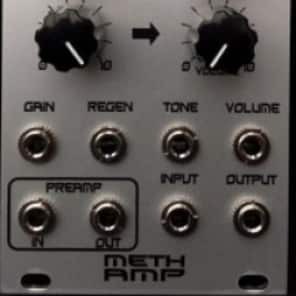 Meth Amp is based around the fuzz core of the Electro Harmonix (EHX) Big Muff π pedal. Lovely fuzz and distortion based on the classic Big Muff pedal! It’ll do wooly warm fuzz, subtle tone shaping with a soft saturation/colour, feedback madness and work as a great output VCA (LPG style tones possibly too). The clipping diodes have been replaced by red LEDs to take account of the change in power supply from 9V in the original Big Muff to +/-12V in Meth Amp. To the fuzz core has been added a bunch of OTAs, each controlling a different aspect of audio processing: gain, regen (a new feature – not present in Big Muff), tone and volume. Thereby, each feature is fully voltage controllable. 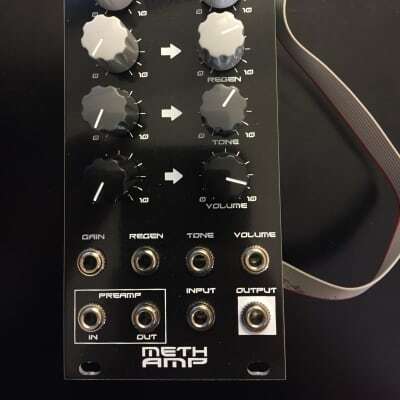 Additionally, there is a separate x100 preamp which can be used to boost external audio for further processing by Meth Amp.